Charlemagne Masséna Péralte (1886 - 1 November 1919) was a leader in Haiti. He stood against the US Invasion of his country in 1915. He led fighters called the Cacos against the US forces in Haiti. The US needed to get more soldiers because Peraite was difficult to stop. :213 Péralte is a hero in Haiti today. He was born in 1886 in the Hinche, His family had come from the Dominican Republic. Name on birth certificate: François Borgia Charlemagne Peralte, Date of birth on birth certificate: 10 October 1885. His father was General Remi Massena Peralte. An officer by career, Charlemagne Péralte was a military officer and chief of the city of Léogane when the US Marines invaded Haiti in July 1915. (See United States occupation of Haiti (1915–1934)) He did not surrender to US troops without fighting, He quit his job and went home to Hinche to take care of his family's land. In 1917, he was arrested. He tried and failed to rob a police payroll. He was sent to labor camp for five years. :212 He escaped. He then got other fighters and began battles against US troops. Péralte's fighters were called "Cacos", a historic name of previous heroes. The Cacos were strong fighters. The US had to send more soldiers. The US had to use airplanes. :213 The "Cacos" attacked Port-au-Prince in 1919, but did not win. Péralte waged an effective guerrilla war against the US occupiers and succeeded in establishing a provisional government in the north of the country in 1917. But he was betrayed and murdered by one of his generals. 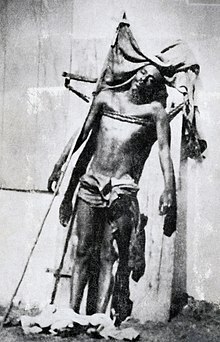 The US marines wished to make an example of Péralte by taking a photograph of his body tied to a door for distribution throughout the country. The US troops took a picture of Charlemagne Péralte's body tied to a door. The picture was shown in many parts of the country. The picture looked like the crucifixion and made Peralte a hero and a martyr. :218 His body was removed from its grave in 1935 for a special funeral. The the then-President of Haiti, Sténio Vincent attended. The funeral was held in Cap-Haïtien. His grave can still be seen today. A portrait of Charlemagne Péralte can now be seen on Haitian coins. These coins were stamped by the government of Jean-Bertrand Aristide after his 1994 return. ↑ "An Iconic Image of Haitian Liberty". The New Yorker. Retrieved 6 January 2017.